Now that the spring season is full swing, athletes are turning in key performances to not only help their respective teams come out on the winning side, but to help get them closer to securing a spot in their state tournaments. New Britain’s Gabriella Roy and Goodwin Tech’s Tommy Hughes have done that this past week and over the course of the season. The New Britain softball team was able to break out of a five-game losing streak, cruising past Wethersfield (10-0) and Plainville (14-3), on Thursday and Friday with Roy playing no small role. On Thursday, the senior shortstop broke the New Britain High School record for most career hits with 103. But Roy hasn’t just broken one record. She just closed in on most doubles in a season with 17 and closing in on another as the all-time leading hitter in terms of batting average, which is .400. Roy is at .450. She also is currently up to 200 on-base appearances and is 13 runs away from hitting 100 for her career. Roy needs 10 RBI to set the career mark. On Sunday afternoon, Roy received the Connecticut Association of Schools (CAS) Scholar-Athlete Award for her dedication to not only athletics but her studies as well. She is the first in her class and will be attending the University of Connecticut in the fall. The Goodwin Tech baseball team secured its spot in the postseason last week. The Gladiators swept the entire week, winning four games - Grasso Tech, Prince Tech, Kaynor Tech and Abbot Tech - with Hughes playing a large part in the victories. Against Grasso Tech, the senior collected three hits and carried that over the next day against Prince Tech. Against Kaynor Tech, Hughes went 1-for-3 and played shortstop before head coach Joe Granja brought him to close out of the game. Kaynor Tech didn’t have much of a chance. “When I came in to pitch the last inning, I struck out all three batters,” Hughes said. But he saved his best outing of the week for Friday, throwing a complete game vs. Abbot Tech, while striking out 11 in the 9-1 win. At the conclusion of the regular season, Hughes is expected to be all-conference for the third time in his career. Through the last 14 games, Hughes has a 3-2 record, two saves, 2.15 ERA and 53 strikeouts in 28.1 innings. As for college next year, Hughes already knows where he will be playing - Division II at Southern Connecticut State University. 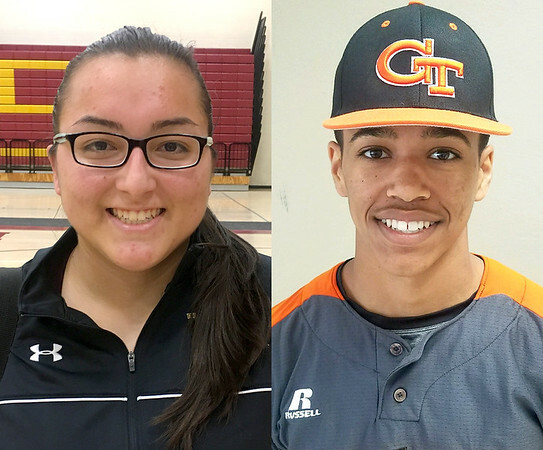 Posted in New Britain Herald, Athletes of the Week, Goodwin Tech, New Britain on Monday, 7 May 2018 20:52. Updated: Monday, 7 May 2018 20:55.